Nigel Farage (left) with Douglas Carswell last year. Carswell defected to Ukip from the Tories in 2014 [Image: Stefan Rousseau/PA]. 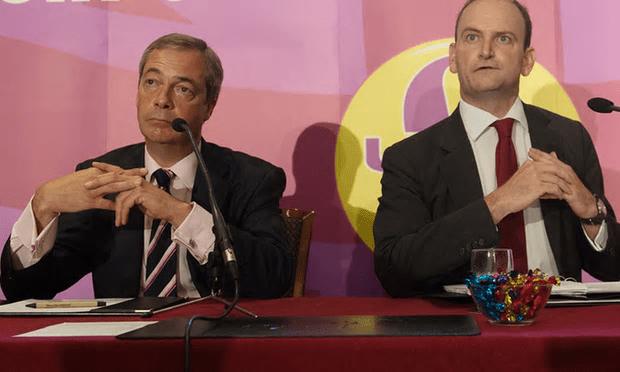 When Douglas Carswell and his erstwhile Parliamentary colleague Mark Reckless defected to UKIP, it fuelled speculation that the Tories were infiltrating UKIP for their own purposes. This Writer thought they were trying to push Britain further to the right of the political spectrum; it seems they may have been trying a simple act of sabotage instead. The allegation that Douglas Carswell passed sensitive information to the Tories that allowed them to carry out ‘push-polling’ of course adds to the wealth of information about alleged election fraud carried out by the Conservatives in last year’s general election. If it is proved true, Carswell may face prosecution, and will almost certainly have to vacate his own seat in preparation for a by-election – in which it may be returned to the Conservatives. So UKIP has at last found a way to make itself look really stupid. Senior members of Ukip have accused the party’s only MP of helping the Conservatives defeat Nigel Farage in South Thanet in the general election last year, according to Ukip’s main donor, Arron Banks. Farage, then the leader of Ukip, was beaten by the Tory candidate, Craig Mackinlay, after a controversial campaign in the Kent constituency. Banks’s company has written to Kent police with the allegation that Douglas Carswell, the Ukip MP for Clacton, helped the Tory campaign retain the seat. It details allegations that Carswell downloaded Ukip data for South Thanet and passed it to the Conservatives, enabling them to do “push polling” of key voters. Never heard of “push polling” before. Is it illegal? It’s for a very good reason that Guardian cartoonists always depict UKIPpers as snakes! Mike, I might be being a bit slow, but what exactly is the fraud here? Is it the passing of information, the Data Act implications of using data that is effectively “stolen” from the organisation who will have paid to it, the Data Act implications of failing to keep data safe, or the use of push polling? The implication is that the Tories gained advantage via a deception by Carswell (that enabled him to pass the information on to them). It would certainly have had a monetary value that went undeclared. The only problem with the laughable idea that UKIP is far right is that a considerable number of its members are ex labour or lib dem supporters and the vast majority of leave votes came from labour constituencies, the labour parliamentary party is out of touch with its membership. Okay, tell me a socialist policy that UKIP has, then. This whole thing smells strongly of Tory & UKIP corruption, and there’s plenty of that around.